We asked Dr. Kathleen Holden to help us figure out how to tell when we need help with our achy joints. Doctor Kathleen Holden has run countless half-marathons. She is the veteran of two marathons, and will run her third later this year in Chicago. There are lots of reasons to be impressed by her, but this week, we're focusing on her because she's one of our favorite types of people--a sports medicine physical therapist. We asked Kathleen to help us break down what it means for a joint to need support. "Technically speaking, the joint itself refers to the bone-on-bone part of your body. But there's lots of soft tissue around bones, and all of that stuff can affect the way the joint performs, so when we ask about the joint, we typically mean all of that," she said. "If your IT band [the tissue on the outside of your leg that stabilizes your knee] has problems or if your kneecap is rubbing up against your femur--these are all things we see." 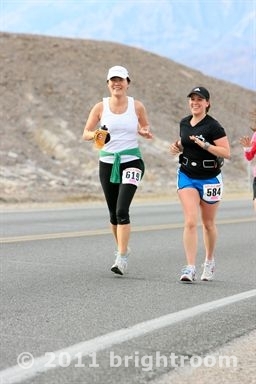 Dr. Kathleen Holden (R) seen here with a pal during the 2011 Death Valley Half Marathon, was a great resource for us to tap for this article. Everyday athletes might be too bent on training hard, or "getting past the pain" to ask for help, but it's important to know when to ask for professional help. "Typically we see a lot of overuse injuries," she said, noting that these can happen to everyone from beginner runners to seasoned marathoners, bicyclists, and swimmers. Symptoms might be swelling or redness, and aching around the affected joints. "Patients might complain of everything from an achy soreness to a sharp, stabbing-type pain," she added, although the latter type of pain is a good indication that you might have had an acute injury, as well. If that were to have happened, said Dr. Holden, the patient might have "felt or heard a pop and get immediate pain at the site of the injury." Athletes might also look for general stiffness, problems bearing weight, general weakness, and difficulty walking. But that's by far from the end of the road. Never fear! A good physical therapist can get you back on the road, and even give you tips to get stronger and stay that way after the injury's healed. But he or she is likely to prescribe a good support, like the ones we have on offer in our shop. Compression, says Dr. Holden, is a key factor in helping an injury to heal. "A good brace or support will offer a fair amount of compression, which is good for healing and can shorten recovery time," she said. Rest and gentle exercise that doesn't stress the joint are good ways to get back on the road to recovery. In no time at all, you'll be back on track to your next personal best. Dr. Holden's next race, the Chicago marathon, is known for being fast and flat. We're hoping she bests her personal time and walks away with no injuries. Should we get injured, though, we're happy knowing she and her colleagues are around to help.